The 2014 SEMA Show is well under way and AmericanMuscle has been on location to bring you the coolest Mustangs from SEMA. Each year SEMA welcomes automakers and aftermarket performance shops/manufacturers to showcase everything from new parts to one-off vehicles they have been working on. There are acres upon acres of amazing cars that are showcased at SEMA, and with this year being the 50th anniversary of the Ford Mustang there are a copious amount of Mustangs this year. Let’s take a look at some the highlights from the show. 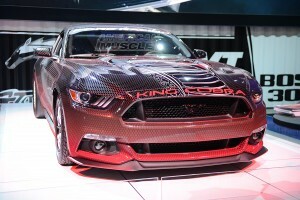 Ford surprised everyone with a 2015 Mustang donning the “King Cobra” badge and graphics. Paying homage to the 1978 King Cobra Mustang II, this 2015 reboot bares little in common with its predecessor other than the name. Grabbing everyone’s attention is the King Cobra’s appearance package with a snake-skin themed vehicle wrap featuring a large King Cobra graphic on the hood, paired with a set of retro-inspired drag wheels. As far as performance goes, the 2015 Mustang King Cobra is basically and amalgamation of the Drag Pack, Handling Pack, and Roush supercharged Super Pack post-factory part packages distilled into one vehicle. Infused with a wide-range of suspension and handling parts, and mixed with some bolt-on power mods and a Roush-Ford Racing Supercharger, you get a Mustang that does the 1/4 mile in 10.97 Seconds @ 128MPH. 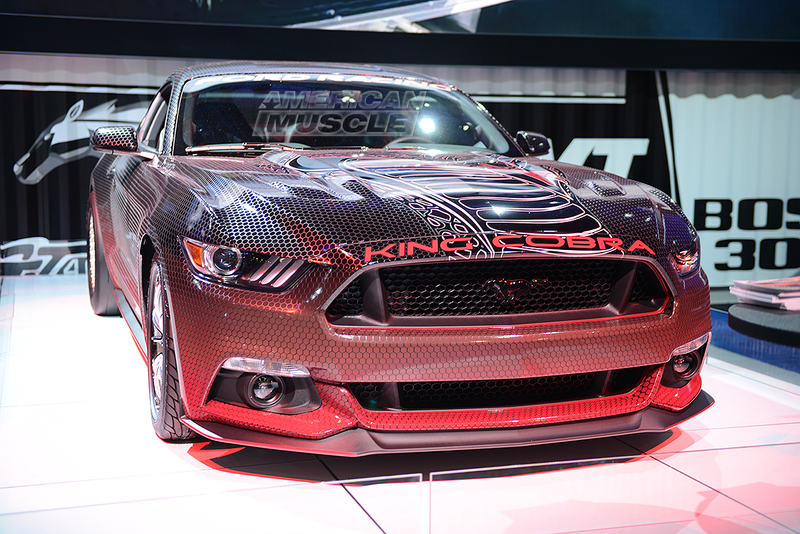 The King Cobra is ultimately all the 2015 Ford Racing catalog parts assembled into one Mustang. It is uncertain if the 2015 King Cobra Mustang will be available for purchase straight from the dealer or if it is up to the 2015 Mustang owner to “King Cobra-fy” their Mustang. 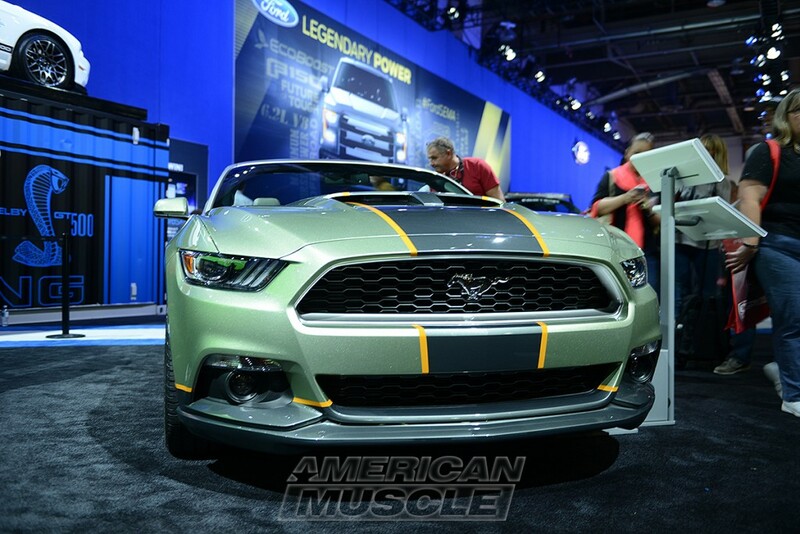 The 2015 RTR Mustang popped up on our radar back when the RTR was revealed at the 2014 AmericanMuscle Car Show. 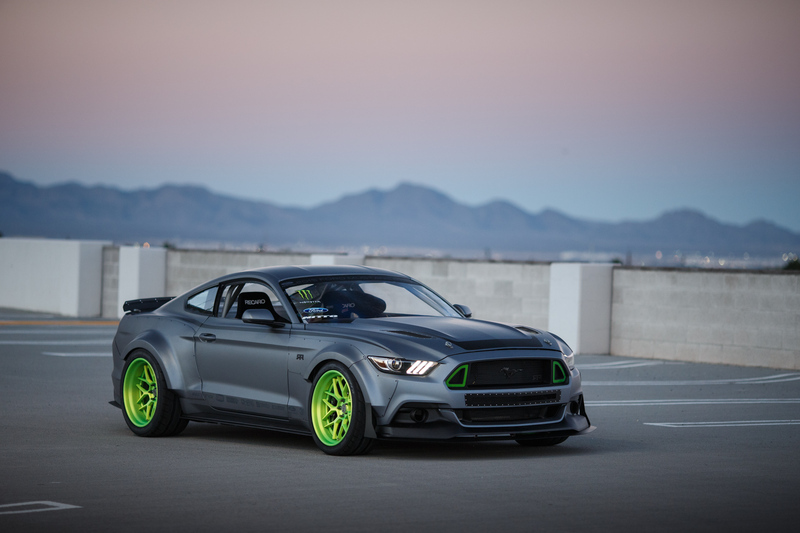 This past week, Vaughn Gittin Jr. debuted the 2015 RTR in person and released all of the specs on the new generation of RTR Mustang. Coming in two different trims, a Spec 1 package will be offered that is focused on styling modifications while a Spec 2 package will focus on styling as well as the signature RTR performance. The 2015 RTR Mustang is going to be available with the 2.3L EcoBoost, 3.7L V6, and the 5.0L GT and can be purchased from RTR authorized Ford Dealerships this January. If you have a 2015 Mustang and want to modify it with some RTR goodies, AmericanMuscle is your go-to supplier for RTR parts and will have a full selection of 2015 Mustang RTR Parts this January as well! Continuing the trend of awesome Mustangs from RTR is the crazy 2015 Mustang RTR Spec 5 concept. Replacing Vaughn’s 2014 Mustang will be this 2015 RTR Spec 5 which is like a vehicular extension of Vaughn himself. A wide-body kit with a flared fenders in the front and the rear help to accentuate the lines of the 2015 Mustang and give it a truly aggressive, RTR look. Sadly, the RTR Spec 5 Concept will not be available for retail and will only be Vaughn’s newest drift car; we can look forward to seeing it destroy set after set of tires on the track though. Ken Block, who is typically seen behind the wheel of a Ford Fiesta, has slipped behind the wheel of an insane 1965 Mustang. For his upcoming Gymkhana 7 video, Ken Block is going to be piloting a 1965 Mustang that is powered by a Roush Yates 410ci Ford V8 that is backed up by a 6 speed transmission, which puts the power down to all four wheels. 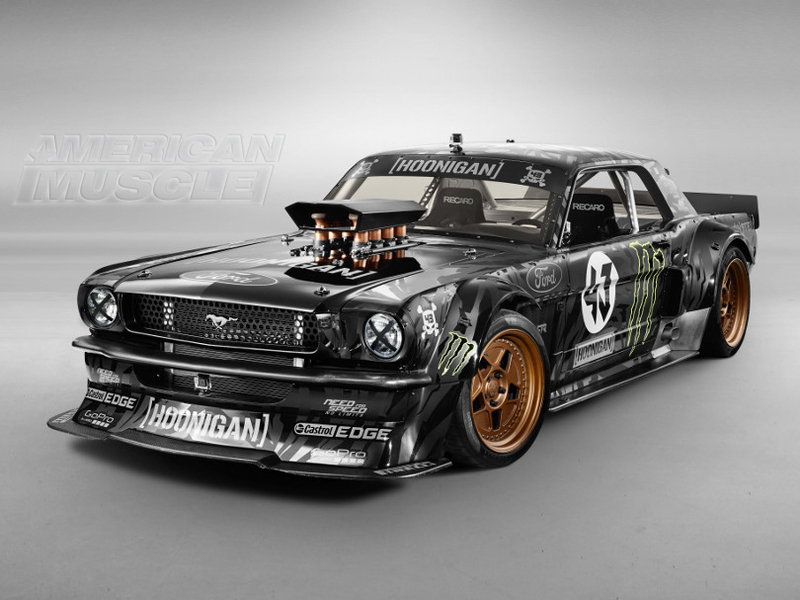 This Mustang puts down a jaw dropping 845 HP and does so in a DTM/WRC inspired 65 Mustang Body. 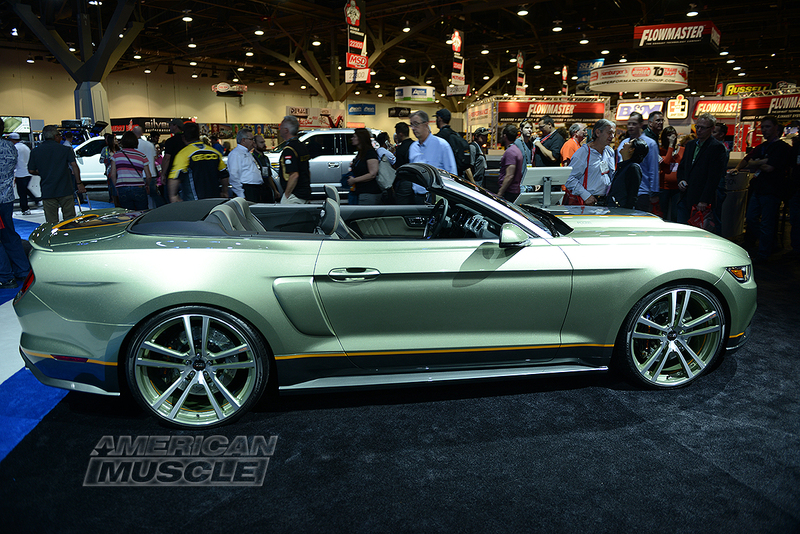 Back when Chip Foose announced the winner of MMD at #AM2014, he also announced that he was going to be working on an MMD Mustang with AmericanMuscle for this upcoming year. Chip Foose debuted what he was working on and it is gorgeous. Chip got his hands on a 2015 convertible and gave it is his signature look with some great coloring, styling accents, and Foose Wheels. Foose will soon be unveiling parts for the 2015 Mustang that he has been working on and we can not wait! The MMD team has returned to SEMA with a sleek and stylish 2015 Mustang that utilizes a large array of new MMD parts for the 2015 Mustang. 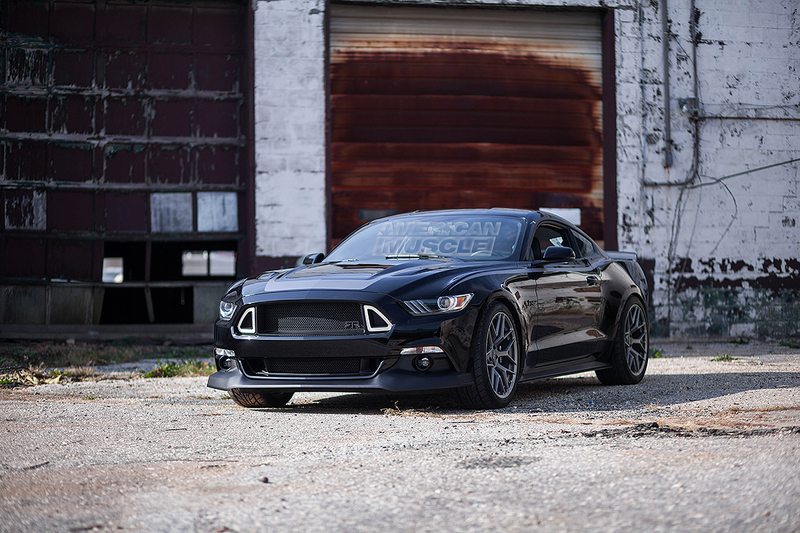 Using a black and red color scheme that is carried through to the MMD 551C wheels, the MMD V Series takes signature MMD styling and applies it to the 2015 Mustang. Once the MMD V Series Mustang returns from SEMA, the Bama Team has some big plans for this car and will working to make it one of the meanest 2015 Mustangs around. 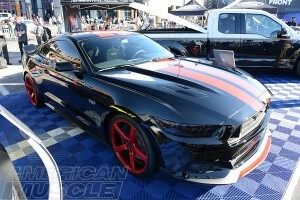 What is your favorite Mustang of SEMA?